The year was 1989 and I was working as a waitress in a cocktail bar… I kid, I kid. 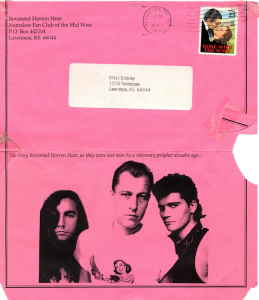 The year was 1989 (that much is true). 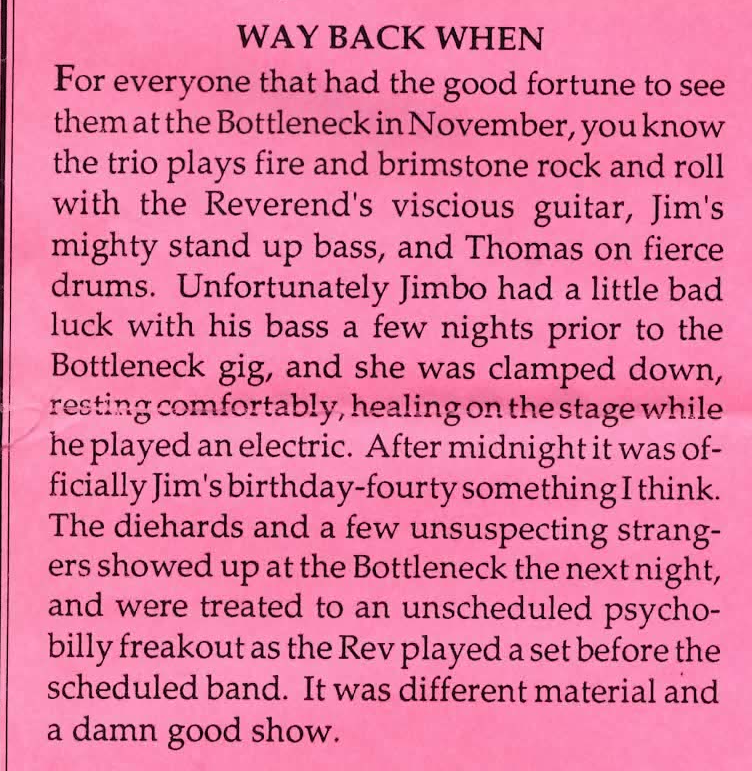 I was working at Pennylane Records in Lawrence, Kansas, when my buddy who worked at Kief’s, the record store across town, called to tell me that a cool band was playing at the Bottleneck that night. My buddy even gave me the band’s 45 (with Big Little Baby on Side A) to check out. That night we met down at the bar and, along with about 30 other people, saw one of the most fabulous big little shows in the history of the universe. 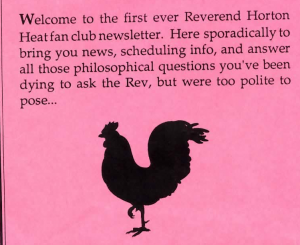 And apparently I joined a fan club, because I got this “Untitled Newsletter Regarding The Reverend Horton Heat” in the mail in April 1990. The Reverend is an Aquarius, which is a good thing for fans to know, right? Granted, nothing beats the Internet for fans who want to find a good show and stay on top of a favorite artist’s news. In fact, this week I followed the press coverage of Billy Joe Shaver‘s new record release online, then got a friendly e-reminder via Facebook that he was playing a free in-store performance at Waterloo Records on Tuesday, when the record came out. On Tuesday, I showed up to see Billy Joe play and to pick up his new release (on vinyl, aka print for music). But print has sticking power. 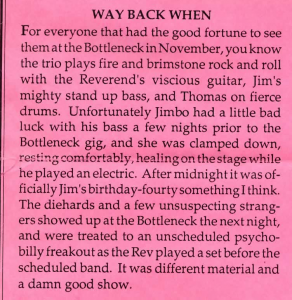 In the April 1990 Reverend Horton Heat newsletter, I’m reminded of details from his show at the Bottleneck, way back in November 1989. 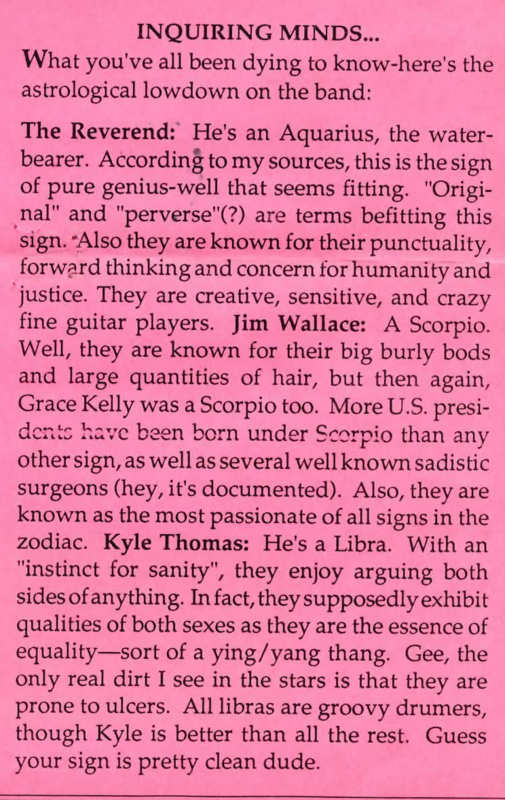 Ten or 20 years from now, I won’t dig through my old mail and pull out a flyer from the Billy Joe Shaver Waterloo Records gig or his printed fan club newsletter to show my future grandchildren. 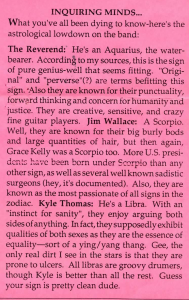 At least I have the vinyl … but that story requires a digging through a much bigger stack.